But no matter how far out he’s gotten, Patton’s fans know he’s never lost his pop smarts – or his affection for club and beat music. Recent collaborations with hip-hop producers fueled rumors that Patton was at work on a set of radio-friendly rap-rock tracks. Well, Peeping Tom is finally here, and it’s as exciting as anticipated. Unsurprisingly, it’s also challenging. No concessions to trends here – instead, Patton applies his art-damaged aesthetics to musical contributions by some of the biggest and freakiest names in the rap and dance music underground. The list of collaborators on Peeping Tom is pretty stunning. Patton coaxes a typically extraterrestrial performance out of Kool Keith on “Getaway”, and adds some of his trademark mania to Massive Attack’s laidback funk on “Kill The Deejay”. All-star turntablist Kid Koala shows up to cut “Celebrity Death Match” into ribbons, and there’s even a Brasilia-rock hybrid (“Caipirinha”) recorded with the estimable Bebel Gilberto. Most remarkably, Norah Jones does her OutKast cameo one better here, fully inhabiting her role as femme fatale on “Sucker”, and sounding disturbingly at home with Patton. “Mojo”, the lead single from Peeping Tom, is no less star-studded: Rahzel of the Roots opens the track with some off-the-wall beatboxing, and the always-courageous Dan the Automator gives Patton a hazy and sometimes explosive track to spit over. 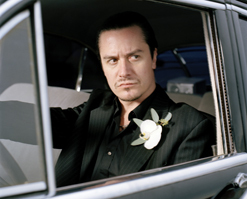 From Faith No More’s disturbing version of the “be aggressive” chant to Mr. Bungle’s evil circus music, Patton’s writing has always incorporated elements of cultural criticism. The video for “Mojo” continues his satirical streak. It’s a send-up of channel-surfing, complete with an old television that switches frenetically between images that will seem uncomfortably familiar to anybody who has logged hours before the tube. Patton and director Matt McDermitt show us a gesticulating weatherman, an officious looking spokesperson on a C-Span set, a faux beer commercial with a dancing girl that happens to be supermodel Rachel Hunter, a COPS knockoff featuring Mark Hoppus of Blink 182 being cuffed and hauled in, a crime drama that looks suspiciously like the unending Law & Order, a cooking show called “28 Minute Meals”, and so on. The attention to detail will have you doing a double-take: for a second, you’ll believe you’re watching footage captured from contemporary television. McDermitt plays with corporate logos – during a typically “emo” scene from what is ostensibly a teen drama, the screen reads EOX rather than FOX. Meanwhile, Patton himself performs in front of a test pattern. For a guy who’s been hard-rocking for several decades now, he looks remarkably good – he’s got the well-preserved carriage of a messianic preacher. The screen goes fuzzy from time to time, and the camera pulls back to take in the interior of a typical California house. Only at the end of the clip do we see the man working the remote control – a complacent-looking Danny DeVito, sitting on the sofa in a robe. It is hard for us to express to you how thrilled we are to be working with Rai Sandow and everyone at Ipecac Recordings on this star studded video. Ipecac is one of our favorite labels to work for and we are very confident this new clip will find a home within your programming. After a brief tour of the US and Europe, a full Peeping Tom United States tour will follow in the coming months. As always, we will have plenty of copies of Peeping Tom available for all of your on-air giveaway needs. If you need more info, call Andy Gesner at 732-613-1779 or e-mail us at HIPVideo@aol.com. You can also visitwww.Ipecac.com to find out more about Peeping Tom.